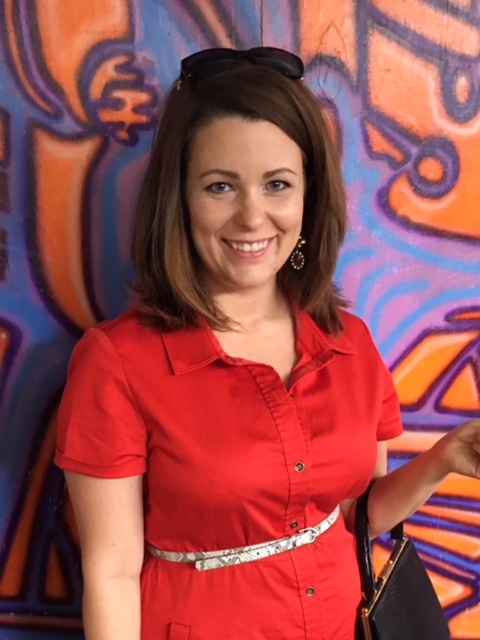 Christina Clark is a local painter, photographer, and visual artist. She works largely with recycled materials to create 3D art and fashion. 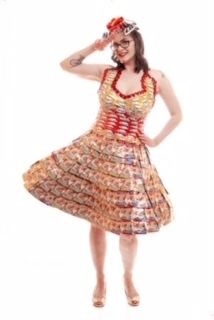 “Delectable” is a wearable sculpture dress made from trash; namely, cat food treat packets called Delectables, hotglue, scrap fabric, and sequin trim. It will be shown at the Sierra Club Hoosier Chapter exhibition, Environmental Justice in Indiana, in May and June at the Indiana Interchurch Center. More information on the exhibition can be found here. Q1: What is your biggest inspiration as an artist? One of my biggest inspirations as an artist is my partner, Bobby Pirtle. Bobby gets up at 4:00am every morning to care for a feral cat colony. Bobby began caring for the colony when he noticed several stray cats outside his office. Bobby has continued to care for the colony every day for the past 13 years including spay and neutering new arrivals, building winter shelters, spending over $5,000 in cat food every year, and adopting a few of the friendlier cats. Bobby’s commitment to the colony inspires me and reminds me how important it is to care for all living beings. He’s also pretty hilarious. Q2: What role do you see artists having in the environmental or social justice movements? How important is art in these contexts? I believe artists have a unique opportunity to help others reimagine a world that is equitable, habitable, and sustainable. Artists also have the opportunity to explore difficult concepts including the effects of environmental degradation, inequality, the various root causes, and the collective impact constant consumption has on people and the environment. I believe art has the ability to challenge assumptions and change attitudes in a way that can reach both individuals and the masses. Q3: What do you think are the biggest environmental challenges we face in Indiana? Indiana faces significant challenges in relation to its air and water quality. Imagining an Indiana where waterways are healthy and the air is clean is exciting, but I think we have a long way to go in realigning our values as a society to favor the quality of the environment over short-term economic prosperity. Q4: What is your one hope for the future of the environment in our state? My hope is that Indiana would lead the nation in technological innovations designed to clean up water, air, and soil contamination; that the people of Indiana would benefit economically from these innovations; and, that the State of Indiana would become a pristine habitat for wildlife and sustainable, thriving communities. You can find her on Instagram @christinaclarkcreates.